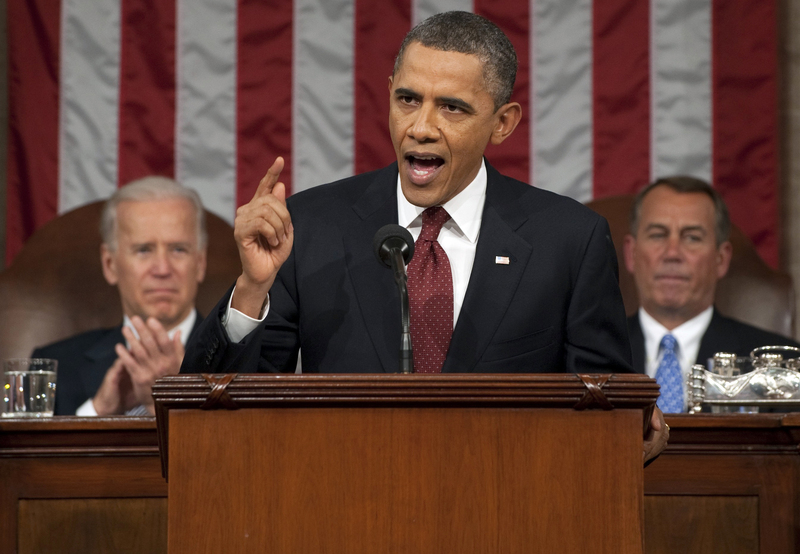 In his third State of the Union address, President Obama outlined a handful economic proposals, as well as an "economic blueprint" for the country grounded in giving all Americans a "fair shot." Below are ten of the speech's key highlights and proposals. Call to impose the so-called "Buffett rule"
Tax reform should follow the Buffett Rule. If you make more than $1 million a year, you should not pay less than 30 percent in taxes. And my Republican friend Tom Coburn is right: Washington should stop subsidizing millionaires. In fact, if you're earning a million dollars a year, you shouldn't get special tax subsidies or deductions. On the other hand, if you make under $250,000 a year, like 98 percent of American families, your taxes shouldn't go up. You're the ones struggling with rising costs and stagnant wages. You're the ones who need relief." (Click on the player above to watch Obama's remarks on the "Buffet Rule"
"When students are not allowed to drop out, they do better. So tonight, I am proposing that every state -- every state -- requires that all students stay in high school until they graduate or turn 18." Mitch Daniels: Obama has "held back" economy, made debt "radically worse"
"Tonight, I'm announcing the creation of a Trade Enforcement Unit that will be charged with investigating unfair trading practices in countries like China. There will be more inspections to prevent counterfeit or unsafe goods from crossing our borders. And this Congress should make sure that no foreign company has an advantage over American manufacturing when it comes to accessing financing or new markets like Russia. Our workers are the most productive on Earth, and if the playing field is level, I promise you -- America will always win." "Join me in a national commitment to train 2 million Americans with skills that will lead directly to a job. My administration has already lined up more companies that want to help. Model partnerships between businesses like Siemens and community colleges in places like Charlotte, and Orlando, and Louisville are up and running. Now you need to give more community colleges the resources they need to become community career centers -- places that teach people skills that businesses are looking for right now, from data management to high-tech manufacturing." "I believe as strongly as ever that we should take on illegal immigration. That's why my administration has put more boots on the border than ever before. That's why there are fewer illegal crossings than when I took office. The opponents of action are out of excuses. We should be working on comprehensive immigration reform right now. But if election-year politics keeps Congress from acting on a comprehensive plan, let's at least agree to stop expelling responsible young people who want to staff our labs, start new businesses, defend this country. Send me a law that gives them the chance to earn their citizenship. I will sign it right away." "Today, American consumers finally have a watchdog in Richard Cordray with one job: To look out for them. We'll also establish a Financial Crimes Unit of highly trained investigators to crack down on large-scale fraud and protect people's investments. Some financial firms violate major anti-fraud laws because there's no real penalty for being a repeat offender. That's bad for consumers, and it's bad for the vast majority of bankers and financial service professionals who do the right thing. So pass legislation that makes the penalties for fraud count." "Tonight, I'm asking my Attorney General to create a special unit of federal prosecutors and leading state attorney general to expand our investigations into the abusive lending and packaging of risky mortgages that led to the housing crisis. This new unit will hold accountable those who broke the law, speed assistance to homeowners, and help turn the page on an era of recklessness that hurt so many Americans." "I'm sending this Congress a plan that gives every responsible homeowner the chance to save about $3,000 a year on their mortgage, by refinancing at historically low rates. No more red tape. No more runaround from the banks. A small fee on the largest financial institutions will ensure that it won't add to the deficit and will give those banks that were rescued by taxpayers a chance to repay a deficit of trust." "At a time when Americans owe more in tuition debt than credit card debt, this Congress needs to stop the interest rates on student loans from doubling in July. Extend the tuition tax credit we started that saves millions of middle-class families thousands of dollars, and give more young people the chance to earn their way through college by doubling the number of work-study jobs in the next five years." "I'm directing my administration to allow the development of clean energy on enough public land to power 3 million homes. And I'm proud to announce that the Department of Defense, working with us, the world's largest consumer of energy, will make one of the largest commitments to clean energy in history -- with the Navy purchasing enough capacity to power a quarter of a million homes a year."